Thanks to intelligent lightweight design, good aerodynamics, innovative technologies, and streamlined production, the Audi Q5 has won the renowned Euro Car Body Award. For the third time in just six years, the world’s most important honor in this field goes to the brand with the four rings in Ingolstadt as recognition of its “Vorsprung durch Technik” in body manufacturing. Audi received the Euro Car Body Award in 2003 and 2006 for the bodies of the A8 and TT, respectively. Both bodies are manufactured entirely or mostly of lightweight aluminum using Audi Space Frame (ASF) technology. 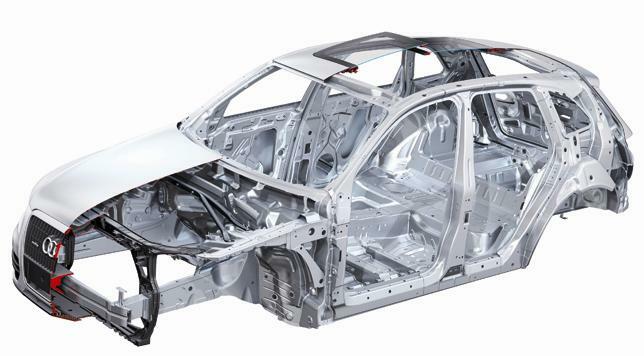 The body of the performance SUV Audi Q5, on the other hand, consists of sheet steel. In this instance, as well, the company from Ingolstadt has developed trailblazing solutions. Thanks to its aluminum expertise, Audi has been decisively driving forward developments in steel construction principles for years, too. Frank Dreves, Audi Board Member for Production, adds: “This triumph is also recognition of the uncompromising precision in car body construction which Audi is known for.” Whether design, production planning, tool manufacturing, car body construction, assembly or paint finishes: ultra-premium quality is always our credo. Symbolized by a bronze trophy, the Euro Car Body Award is presented to recipients selected by a jury of specialists convened by Automotive Circle International in Hanover, Germany. At a conference in Bad Nauheim, Germany, some 550 international body-manufacturing experts declared the Audi Q5 Number One, ahead of twelve competitors. The Audi Q5 boasts the lightest bodyshell in the mid-sized SUV segment: its 355 kilograms (782.64 pounds) are lower than the competition. The Audi Q5 also leads the pack in terms of stiffness/weight ratio - the relationship between weight, torsional rigidity, and size. This is due to the use of many lightweight components. The crash buffers - which are upstream of the front longitudinal members - and their connecting transverse member are made of aluminum. This connection weighs less than five kilograms (less than eleven pounds). Some tailored rolled blanks in the rear floor section have been rolled with varying wall thicknesses to save 1.9 kilograms (4.19 pounds). This is yet another example of Audi’s pioneering excellence. The hood and the tailgate also consist of aluminum, which allows for a reduction in weight of 15.7 kilograms (34.61 pounds) compared to sheet steel. At the heart of the body, however, are the hot-formed steel units. These ultra-high-strength components are used for longitudinal members, the center-tunnel reinforcement, sills, B-posts and the bulkhead transverse member. These unusually light components not only render the body of the Audi Q5 extremely impact-resistant and rigid, but also lay the foundation for precise handling and superb vibrational comfort. At a collective weight of just 44 kilograms (97.00 pounds), the hot-formed components comprise a mere twelve percent of the bodyshell’s mass and weigh 15 kilograms (33.07 pounds) less than conventional components. This reduces the expenditure of energy at Production and fuel consumption for customers. Audi has installed two dedicated production lines for hot-formed steel at its Ingolstadt plant. The plate blanks made of boron-alloyed steel slowly pass through long ovens, which heat the blanks above 900 °C (1,652 °F). They are then quenched in watercooled presses at about 300 degrees Celsius (572 degrees Fahrenheit). As a result of this process, the structure’s tensile strength triples to a maximum of approximately 1,500 megapascals. In addition to lightweight construction, other factors also played a role in winning the Euro Car Body Award. The body of the Audi Q5 allows for a remarkably low drag coefficient of just 0.33. This is due in part to the underbody being almost completely covered with panels, which enhances drag coefficient by 0.02. Additional factors include numerous optimized processes at Production. The Audi Q5’s body is manufactured amidst great flexibility on the same line at the Ingolstadt plant as the body of the Audi A4 Avant; the degree of integration is near 100 percent. To join metal panels, Audi uses high-tech methods such as plasmatron brazing. This technology facilitates the elegant zero-gap joint, which joins the side panels with the roof and the rear panel. Company Audi has informed that on a motor show in Essen planned for the period from November, 28th till December, 7th of current year, it will present for the first time the racing version of coupe R8. 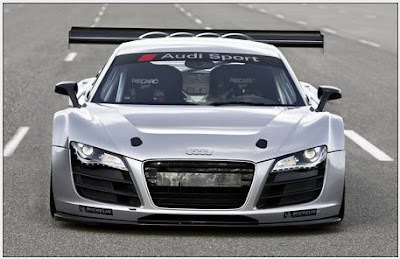 Rear-drive Audi R8 GT3 which capacity makes more than 500 h.p., it is intended for participation in various national and international racing series worldwide. The twisting moment in the car will move on rear wheels by means of the newest 6-step sequency gear boxes while the suspender of model R8 GT3 will mainly use details from serial model. For those who was interested by this car it is necessary to tell that Audi R8 GT3 it will be accessible to orders since autumn of 2009.